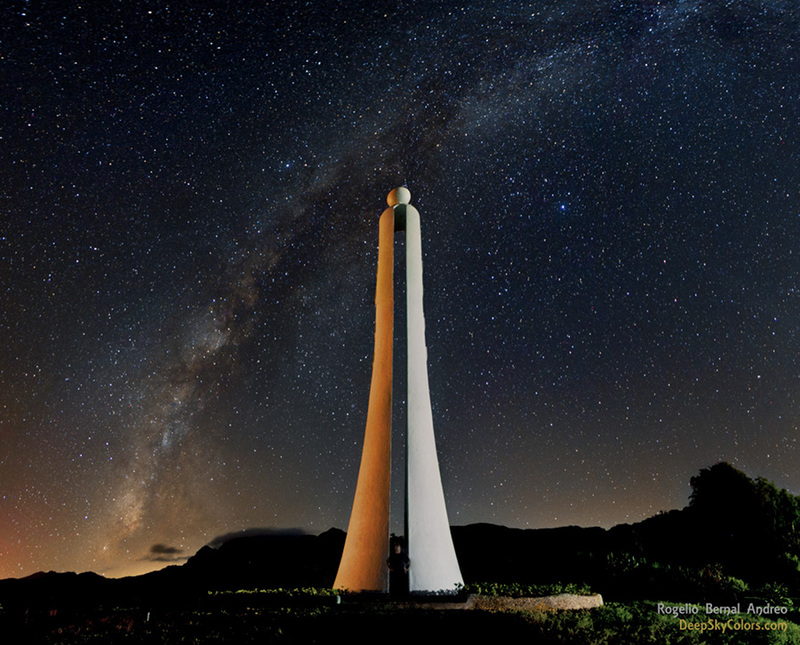 Explanation: This intriguing monument can be found in Taiwan between the cities of Hualian and Taitong. Split into two sides, it straddles a special circle of latitude on planet Earth, near 23.5 degrees north, known as the Tropic of Cancer. Points along the Tropic of Cancer are the northernmost locations where the Sun can pass directly overhead, an event that occurs once a year during the northern hemisphere's summer solstice. The latitude that defines the Tropic of Cancer corresponds to the tilt of planet Earth's rotation axis with respect to its orbital plane. The name refers to the zodiacal constellation Cancer the Crab. Historically the Sun's position was within Cancer during the northern summer solstice, but because of the precession of Earth's axis, that solstice Sun is currently within the boundaries of Taurus. In this starry night scene the otherwise all white structure is colored by city lights, with its orange side just south of the Tropic of Cancer and the white side just north. Of course, there is a southern hemisphere counterpart of the Tropic of Cancer. It's called the Tropic of Capricorn.